The Apple iPad is simplistic in its design, almost sterile. Not actually sterile in regards to germs. Let's be honest; you probably bring that into the bathroom with you. But, I digress. The iPad is a testament to modern design with its aluminum unibody design. Some people want to warm up that cold aluminum look with something a bit warmer. What's better way to warm up than sliding on a leather jacket? RSD had that same idea so they created a Roland Sands iPad Case with leather, zippers, and snaps so your iPad accessory can match your jacket. 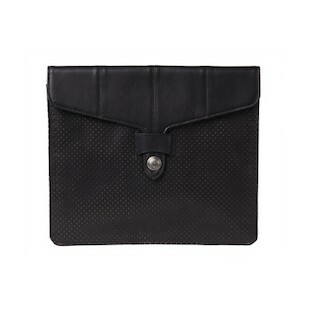 The case can pull double duty as a large wallet/clutch. Pull a Homer Simpson and get this for your lady for her birthday. She'll thank you for the effort but cross your fingers that she won't actually use it as a clutch. Then you can swoop in and wrap your iPad case in waxed and hand finished top grain cowhide. The iPad's aluminum chassis will be caressed by RSD's signature satin numbers lining. Don't let your iPad go another day naked or put it in a boring synthetic plastic case. The Roland Sands Design iPad cover will provide both protection and style, just like RSD's motorcycle jackets. Just stop taking your iPad to the bathroom. Your iPad has enough germs.